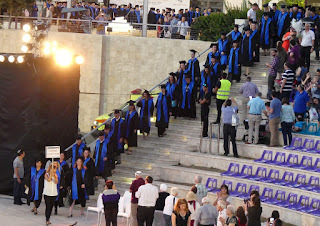 There were over two hundred and fifty other people who received their doctorates from Bar-Ilan University last week. We each received a booklet listing everyone's dissertations. I thought that it might be interesting to share the titles of some of them, to illustrate the extraordinary range of topics. In the Faculty of Law, Dr. Yitzchak Ben David's dissertation looked especially interesting: "A Sinful Ruling: On Error, Authority and Responsibility in Talmudic Halakha - A Study of the Exegetical Processes and Literary Structures in Tractate Horiyot." And in Interdisciplinary Studies, Dr. Dov Berger wrote on "The Developmental Philosophy of Rabbi Avraham Yitzchak Kook and the Theory of Evolution." In Jewish Studies, here's one from Dr. Yehoshua Zekbach that may be of interest to some readers: "The Halakhic Approach of Rabbi Eliezer Yehuda Waldenberg: Sources, Exegesis and Halakhic Decision Making." And Dr. Tziporah Lifshitz's topic looks very original: "Beauty as a Value in Rabbinic Literature: Analysis of Rabbinic Approaches to Beauty in Human Beings and Nature." Moving to the Humanites, one dissertation by Dr. Aleef Faranesh left me scratching my head: "Detective Writing in Modern Arabic Literature." I had a similar reaction to that by Dr. Daphna Cassel: "Contemporary Cinematic Representations of Architectural Transparency: The Case of Twilight and The Dark Knight." In the Social Sciences, this one by Dr. Barak Bouks looks intriguing: "Is Religious Terror More Violent Than Non-Religious Terror? A Quantitative Analysis of Religion and Terror." Several dissertation titles are revealing of Israel's challenges. Dr. Lior Garbi's dissertation was on "Children's Resilience to Ongoing Terror: The Contribution of Parental and Child Personal Resources to the Sense of Coherency, Externalized and Internalized Affective Responses to Post-Traumatic Symptoms." 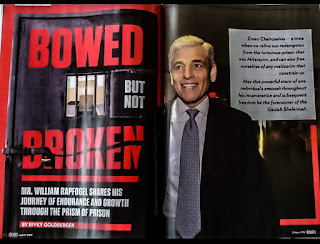 Dr. Jacob Stein wrote on "Expressions of Isolation and Loneliness Following Combat and Captivity Trauma and Strategies for Coping with them in the Life Stories of Israeli Combat Veterans and Ex-Prisoners of War." And Dr. Gali Tangir's topic was "Consequences of Continuous Exposure to a Security Threat on Child Adjustment: The Moderating Role of Type of Community and the Relationship with the Mother." Most entertaining are the titles of the dissertations in the Life Sciences and Exact Sciences, because they are obviously very valuable, and yet so incredibly arcane and incomprehensible. Dr. Dorit Eli's topic was "The Role of Oligoribonuclease in Mediating Biofilm Formation in the Bacterial Pathogen Pseudomonas Aeruginosa via c-di-GMP." Gezundheit! Or how about Dr. Liat Moscovich's "The Role of Spt2 in the Collision between the Replication Fork and Transcription Bubble in the Budding Yeast Saccharomyces Cerevisiae." But I think my favorite is that of Dr. Serge Lukasiewicz, who wrote on "Holomorphic Extension of Fundamental Solution of Elliptic Linear Partial Differential Operators with Analytic Coefficients and Simple Complex Characteristics." I understand (almost) every word in isolation, but I haven't got the faintest idea what they mean when they go together! LOL, you had me there for a second. But you misspelled Rabbi Menken's name! Mazel tov on your doctorate, Rabbi (doctor) Slifkin. I'd be interested to read all the dissertations mentioned in your second paragraph ('In the Faculty of Law...'). Where could I find them? He had me for sure, until I discovered what this web site is for. And now I understand how Rabbi Menken's name could be misspelled. For those still in the dark: Follow the URL above, then lop off everything after "mathgen/" in the resulting destination and send your browser there. Hah. You don't understand even basic mathematics and you think you can comment on חז"ל? :-). מזל טוב, and wishing you much future הצלחה. Mazal Tov to YOU, Natan! are the abstracts or theses available on line? I think I'll have to be more explicit: What's the title of YOUR dissertation? So will you now go into academia? If I had to do it again, that's what I would do. Basically do next to nothing and get paid for it. Plus sabbaticals and summers, and you can earn a lot on the side through speaking engagements. No way. I am a full-time museum director. It looks like Bar Ilan uploads all dissertations to ProQuest. However, one needs a login and password, so I cannot check if the newest ones are there yet. All the dissertations should be online - nowadays, they do it right away. However you need a login to the Bar Ilan library. You'll have to pull a Snowden, d/l all the dissertations we might find interesting (I'd be interested in the one on Horios, I once learned Y Horios (much easier than B Horios) for an Erev Pesach siyum) and put them on a free server. Mazel tov, by the way.